The venue was unconventional – the fabulous rustic grounds of Richardson and Cruddas Mills in the heart of Mumbai. The ramp was a never ending 200 x 20 feet, with high-tech multi laser lights, roving drone and camera mounted on gantry. 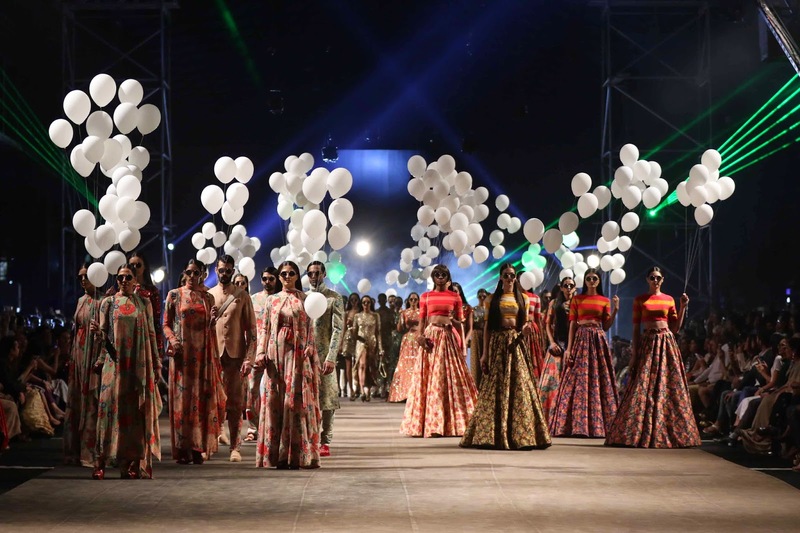 It was the backdrop for a high octane event with the crème de la crème of the city in attendance as one of the best designers in India opened the celebrations of 15 years of fashion in India pioneered by Lakmé, with a spectacular show. 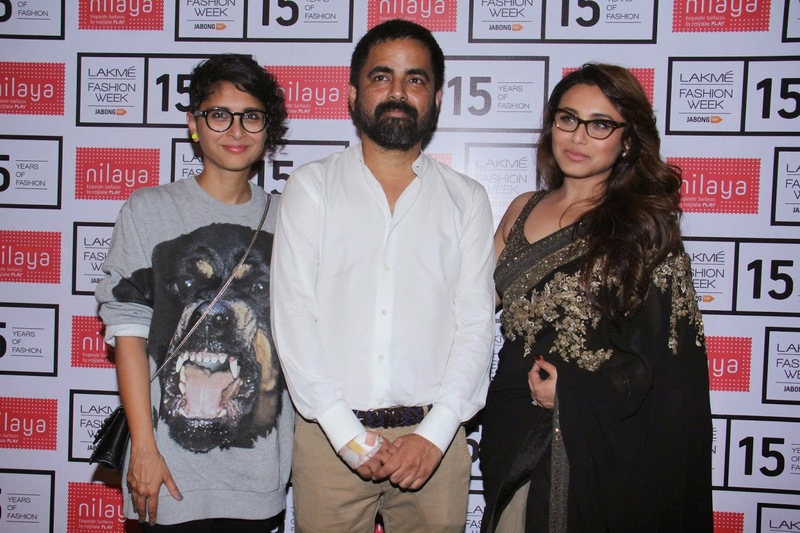 Sabyasachi Mukherjee’s fabulous launch of his new Resort 2015 line “Big Love” for his label, ‘Sabyasachi by Sabyasachi’; set the pace for the week that will follow during Lakmé Fashion Week Summer/Resort 2015. It was love at first sight for the audience as they witnessed a stunning presentation featuring 62 models and 105 outfits. One of the most sought after designers in the country and around the globe; Sabyasachi unleashed a collection of resort wear that was mindboggling in form, colours, fabrics and textures. 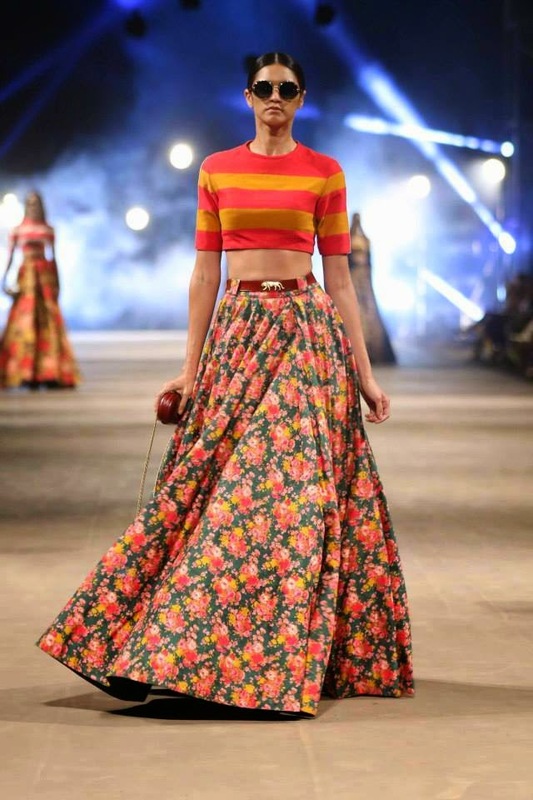 Paying tribute to the 70’s decade, which Sabyasachi adores, the designer revisited the era and showcased it with his distinct signature touches and recreated the power dressing period. Giving a new fashionable dimension to the sari, Sabyasachi brought in a romantic military flavour to the rest of the ensembles. For evening glamour, there was glitter that glistened on the catwalk. The show opened with 70’s hit tunes, as dramatic black featured Sabyasachi’s innovation of the sari teamed with an antique gold embroidered blouse. What followed were pre-stitched draped saris, toga gowns, with shimmering hemlines, saris with net extensions and jumpsuits with sheer net capes. 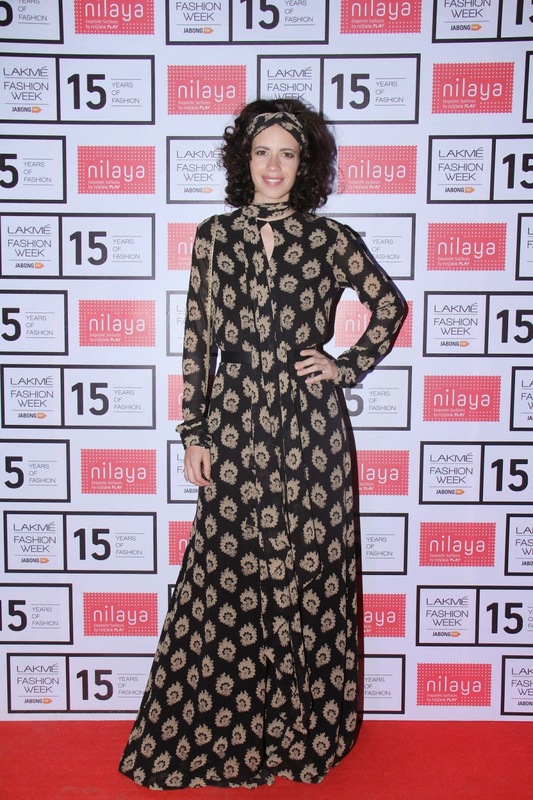 Gradually moving into a colour story of brown, grey and beige, there were bell bottom jumpsuits or palazzos, long maxi shirt waister, layered capes, column dresses, boleros, gilets, a flash of red for the lining of a floor kissing cape and sari gowns that continued to mesmerise the fashion lovers. Strong stark suits with thigh length shirt-coats had a slight regimental look in bottle green or brown. A sudden burst of blatant shimmer came in the form of fully embroidered sequins, crystals and 3D embellishments for minis, shifts, sack dresses, kurtas, gowns and tunics, which were offered in silver, rust or mulitcoloured glitzy options. 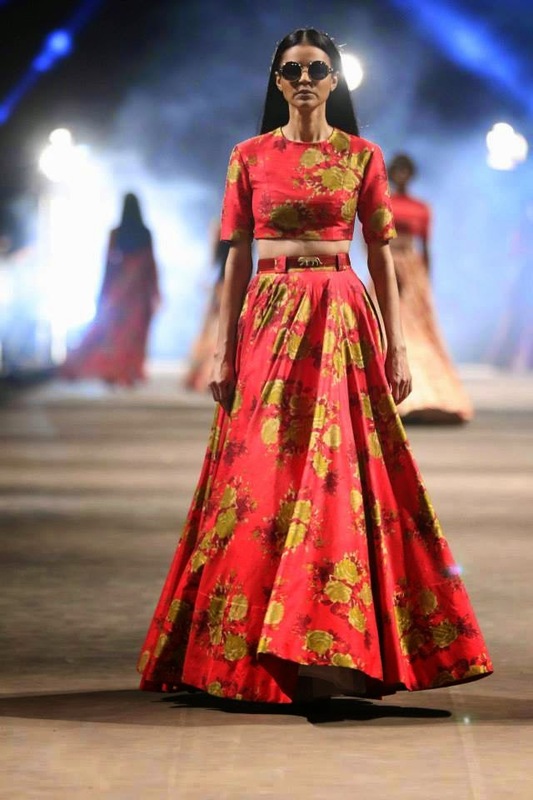 Fabric texturing was at its best, while Sabyasachi moved effortlessly from prints and solids for his selection, which ranged from silk, tulle, crêpe, georgette, to satin and taffeta. The colours soon moved to pastel and pretty shades of pale sea green making a great seaside choice for lazy lounging. At times the dual printed palazzos were interesting with shimmering cropped tops; or the dhoti pants teamed with bralet and waistcoat. For a fun angle there were two dazzling shifts with giant 7 and 4 appliquéd on the front probably confirming the 70’s inspiration. A solitary white sari with a sequinned choli was also a tribute to the designer’s favourite era. 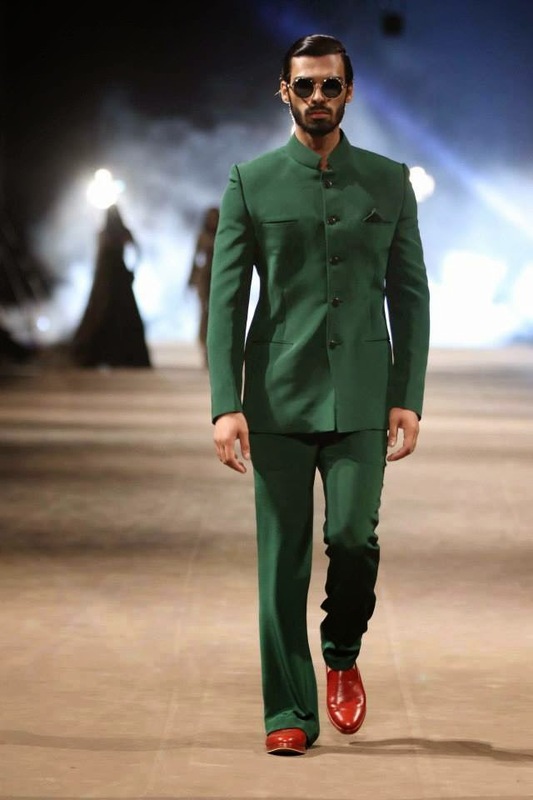 Men’s wear followed the colour story with black kurtas, Bundis and scarves then moved into bottle green and brown for Jodhpuri jackets, with a hint of military flavour. 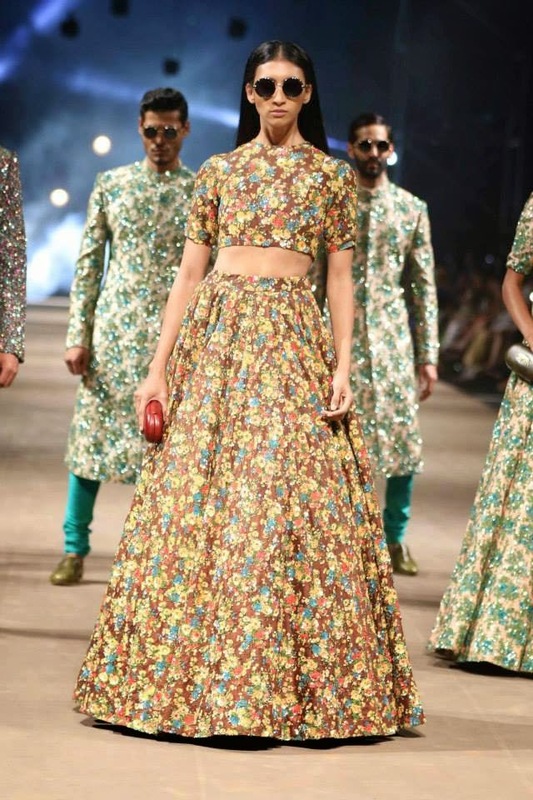 But suddenly Sabyasachi surprised the gathering with brightly coloured floral printed suits, kurtas, Bandgalas, brocade sherwanis and shimmering red printed versions. 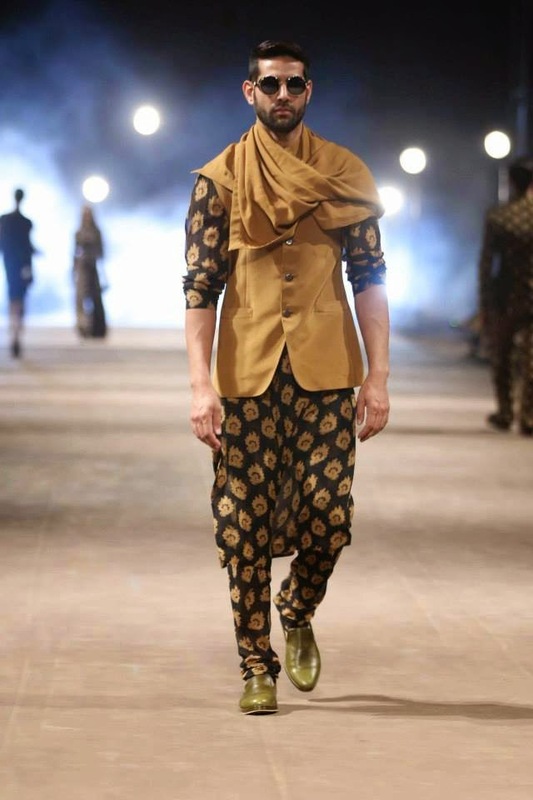 Adding to the flavour of the collection, Sabyasachi had designed matching wedges, embroidered slip-ons, colourful moccasins, monk sandals, messenger and handbags that were in dual sling or shoulder styles to complement the garments. 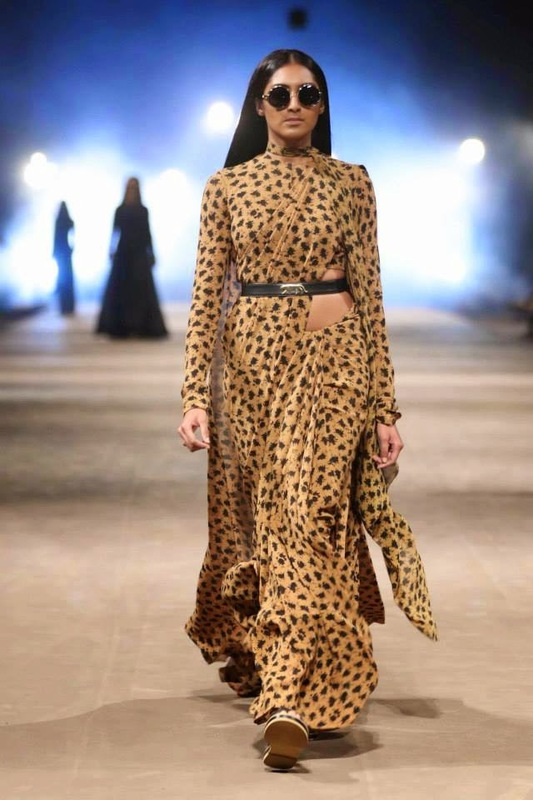 For the jet setting trendy fashion followers around the world Sabyasachi Mukherjee’s Resort 2015 collection “Big Love” was one of the most amazing openings ever seen for a fashion event in India.